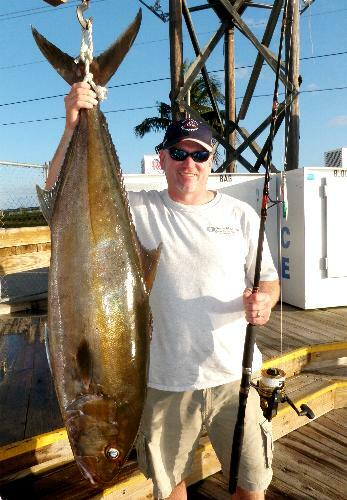 We have giant amberjacks here in Islamorada. These amberjacks are 65 lbs. up to 120 lbs. 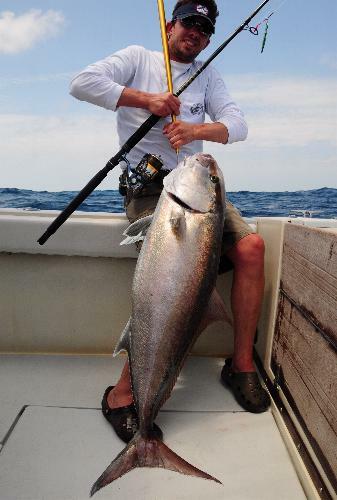 Compare these giant amberjacks to other photos around the southeast where I see mostly 20 - 40 lb. amberjacks. 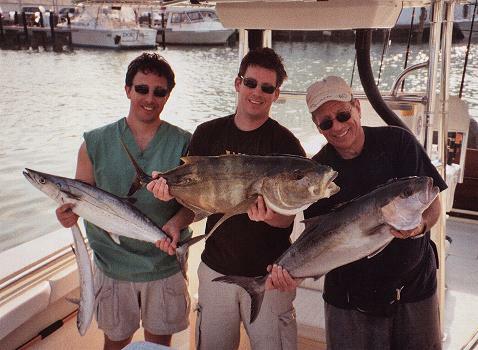 So if you want to "Test Your Manhood," stand-up and dig in your knees to the side of the boat and pull one of these guys up out of 300 feet of deep blue water! As Arnold says: "No Girly Men Here!" 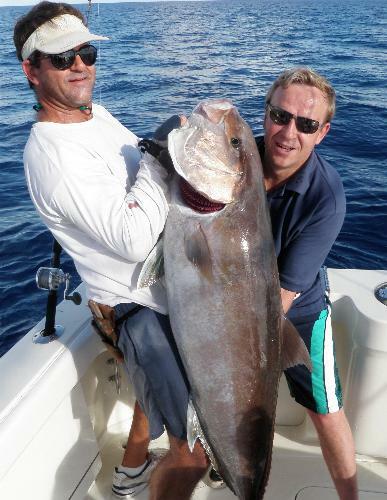 Yesterday, Casey McDermitt (age 15) fought this amberjack for 45 min. on # 50 test stand-up tackle. 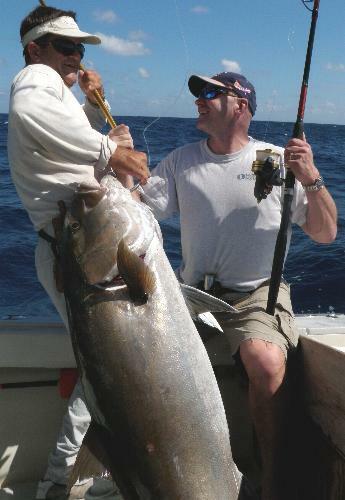 This amberjack measured 68" to the fork and 38" girth. 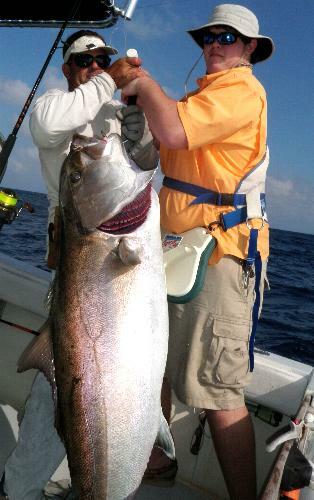 Before I measured it, I estimated this amberjack to be at least 110 lbs. The "fish formula" measurement puts it at 123 pounds, but they inflate a little as they come up out of the deep. If you take off 2" from the girth (which I think is too much to reduce it by) it comes out to 110lbs. I think it was a 115 lbs. amberjack. That's Casey (left-center). He is 6' 6" and is a 260 lb. lineman on his JV football team (I feel sorry for the kids across from him). 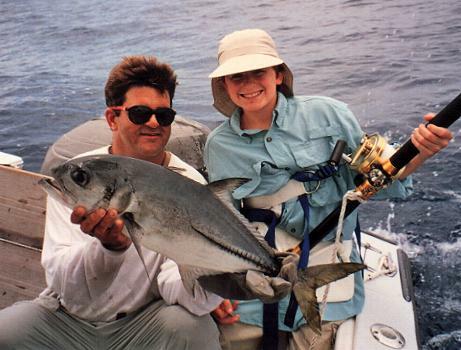 He had great patience and persistence while fighting this amberjack, never frustrated and always impressed with each run. Pat Dowling from New Jersey wrestles up a 91 lbs. amberjack with no less than my big spinning rod with # 80 test braid. Now we typically catch 30 to 40 lb. 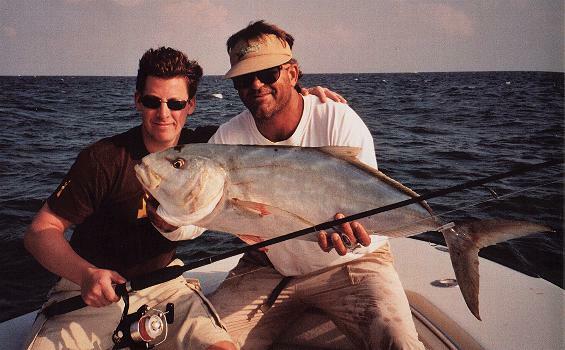 amber jacks on this rod with a metal jig, and we catch the bigger 65 to 75 lb. amberjacks on live bait and my big # 130 test stand-up rod. That's what makes this a hell of a catch, with 15 pounds of drag for 25 minutes at least, holding on for dear life on the brutal runs and pumping her up in between the runs with no stand-up harness to hold the rod, that's what makes this an impressive catch. Pat is a big boy, and loved every minute of it. It is one of the toughest fights in the ocean around here, not just because they are 65 - 120 pound amberjacks (if you've ever caught a small jack, just imagine it). But it is a sprint of a fight. You can not let up for one second and rest, because you're trying to get the fish to the boat before a +900 pound tiger shark eats it up to its head or just swallows a 40 lb. 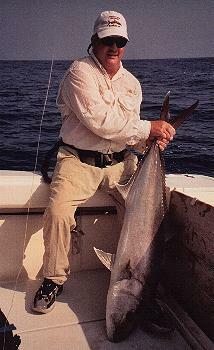 amberjack whole and cuts the mono leader. How do I know there are some +900 pound tiger sharks out there, my commercial fishing buddy caught one one day after he could not get an amberjack into the boat. When we go for the big boys, I strap the angler in to a kidney harness and a big stand-up fighting belt which holds the # 130 boat rod so we can get these big amberjacks up as quick as possible. But the day before Casey caught his 115 pound amberjack, my # 130 drag slipped a couple times so since we caught that 91 pound amberjack on that big spinner with 15 pounds of drag I decided to used my # 50 test stand up rod with 15 pound test maximum drag setting. We were lucky we got it up before the sharks got it. Later we lost a nice tuna to a shark. 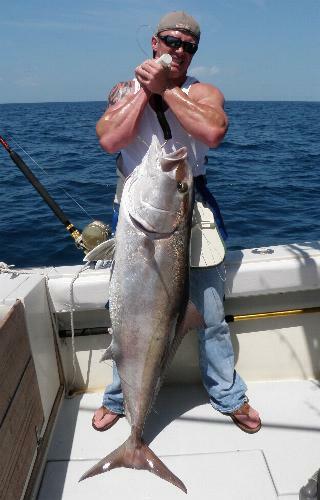 Shane McDermott says these 70 pound amberjacks are good workouts while on spring break from UM's spring football camp. He is their freshman center. Best of luck buddy! This guy caught this 75 lbs. amberjack on #80 braid while I filled in as mate helping my friend on the private boat he runs. Brandon Wilson, Special Forces Veteran of Iraq and Afghanistan, says these 65 lbs. amberjacks are tough! Thank you for fighting for our freedom buddy! Pat Dowling from New Jersey stands at the scale with his 91 lbs. amberjack. Typically a fish can lose up to 10% 0f its body weight in the fish box. It could have been 100 lbs. Nick Hammond, a tough "Brit," loves jigging up these amberjacks on #50 braid. The typical one taken on these jigs are around 30 -40 pounds, and a great fight with strong runs. 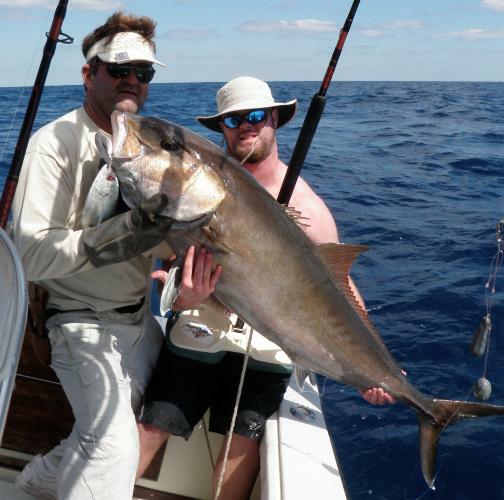 Tony Carter catches a nice amberjack on #30 test. 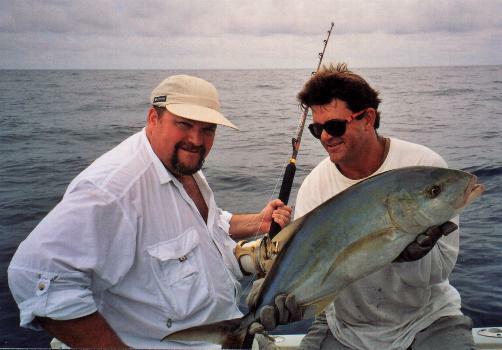 While sailfish fishing we catch big yellow jacks and cero mackerel on light spinning rods. The sailfish and cero mackerel chase the big schools of ballyhoo on the reef pushing them out of the water in large, shimmering, silver waves of jumping ballyhoo which we call: "showers." A nice yellow jack on #15 test. They are good eating. I like them better than dolphin. This is a big horse-eye jack this boy caught standing up with heavy tackle.